Timeless professional expanding wallets feature a classic printed redrope exterior and are favorites of attorneys, accountants and bankers. Redrope gusset with rollover reinforcement expands up to 3-1/2" for bulky, legal-size files. The flap with elastic cord provides extra security. 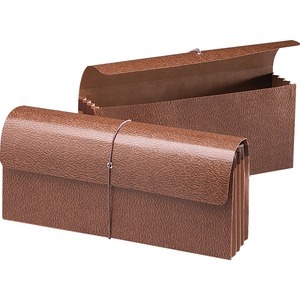 These partition wallets are perfect for shelf filing or on-the-go with a closed top, bottom and sides.